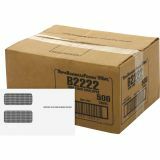 TOPS Double Window Tax Form Envelope/1099R/Misc Forms, Gummed, #24 (9 x 5 5/8), Gummed Seal, 500/Carton - No. 24 white, clear window envelopes are designed for 1099R and miscellaneous forms. Security tinted for privacy. 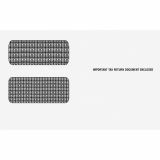 "Important Tax Return Document Enclosed" is printed on front of envelope.